In my kitchen, this recipe wins the prize for most-cooked summer pasta, 2018. 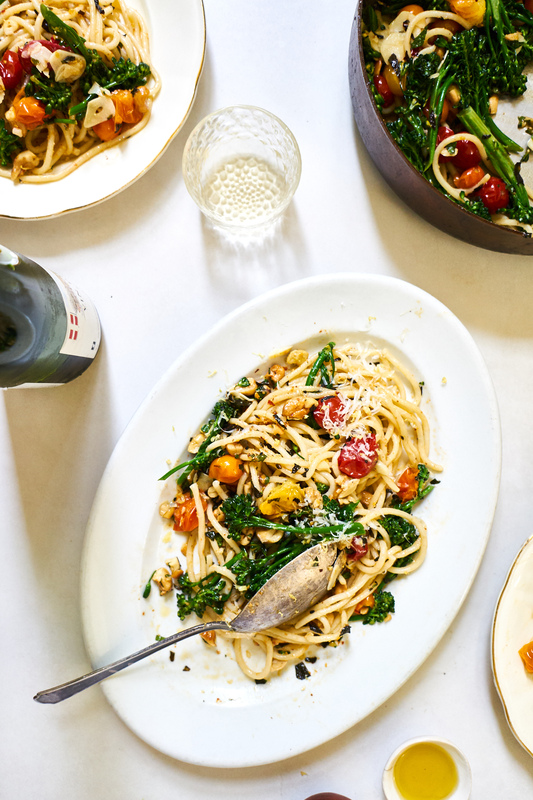 It's a beautiful spaghetti-based tangle built around skillet-blistered cherry tomatoes, accented with lemon zest, mint, broccolini, and toasted cashews. If you have shichimi togarashi in your spice drawer, great! If not, no big deal, some crushed chile flakes work fine. All in all, this is an incredibly simple recipe, while still having all sorts of interesting flavors going on! The inspiration for this recipe come from one of my favorite places - Toiro Kitchen. Naoko posted this recipe. And it found itself on high-rotation repeat in the weeks that followed. I took some liberty with it, and landed on the version below, adding broccolini (or broccoli), little dusting and dashes here and there. Naoko makes it in a beautiful donabe, but I've been making it in my widest pan. You can use either! I've done both, and they're great. My main advice? Use whatever spaghetti you love. 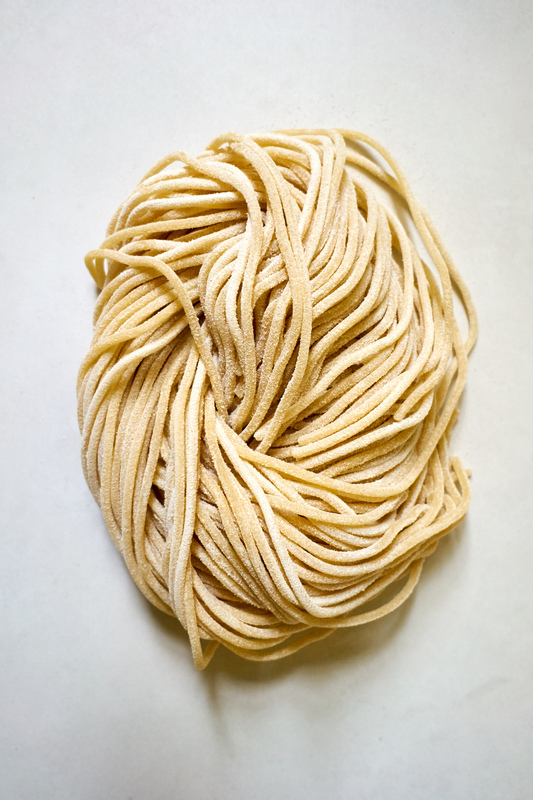 Another wildcard version I was happy with - soba noodles. Also great. One of the things I love about this recipe is how, aside from boiling the pasta, it's a one-skillet meal. Put a big pot of water on, and while it comes to a boil you chop a bit of garlic, and trim some broccoli. It all goes into your largest pan. I also love all the different flavors coming together - chile, lemon, mint, and summer tomatoes. Bring a large pot of water to boil, salt well, and cook the spaghetti al dente, per package instructions. 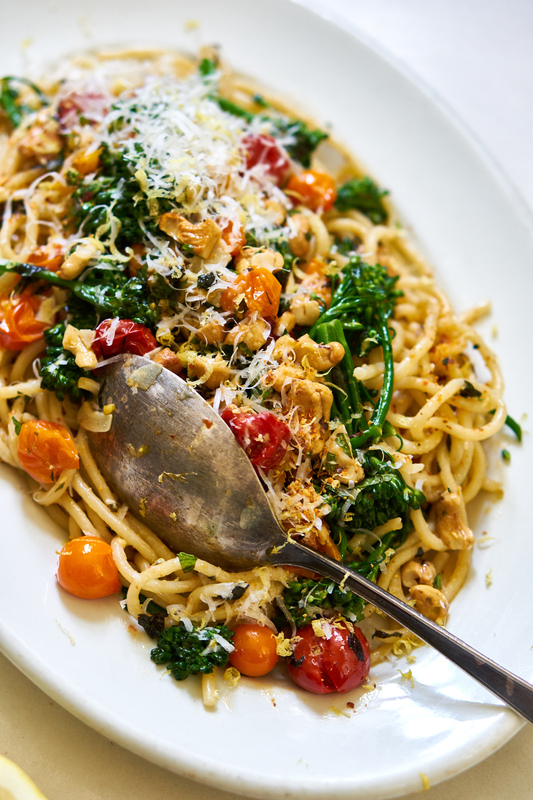 In the meantime, combine the olive oil, garlic, and cherry tomatoes in a large pan or skillet. Set over medium-low heat. Cook, over medium heat, until most of the tomatoes burst, 6-7 minutes, stirring occasionally. About halfway through cooking the tomatoes, stir in the broccoli, and cook for the remaining 3-ish minutes, until the broccoli is bright green. Remove from heat, and season to taste with the salt. When the spaghetti is cooked, drain well, and add to the skillet. Stir in the mint, cashews, and as much shichimi togarashi (or chile flakes), Parmesan, and lemon zest as you like. I typically use about 1 teaspoon of the shichimi togarashi, but each brand in strength, so go slow. Serve in individual bowls, with more shichimi togarashi (or chile flakes), Parmesan, and lemon zest on the side! The real deal. A vibrant pesto recipe taught to me by my friend Francesca's mother who came to visit from Genoa, Italy - hand-chopped basil, garlic, Parmesan, olive oil and pine nuts. The pad thai recipe you're looking for! 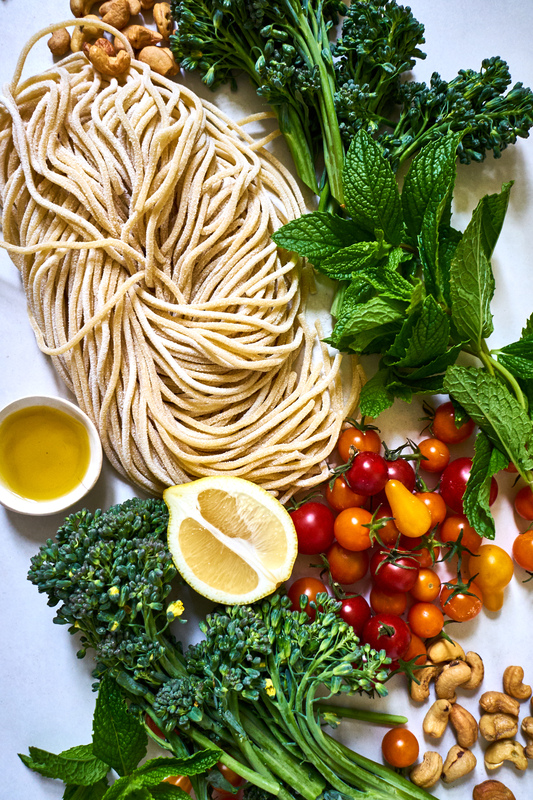 Try this simple trick to make a turmeric noodle version. All things green in a quick, weeknight pasta option. It's feel-good food that won't weigh you down - ponzu dressing, green vegetables, and the pasta of your choice. Peter Reinhart's Napoletana pizza dough recipe. It makes my all-time favorite pizza dough using a delayed-fermentation method.